Mothers day comes once a year, and I know some people have a real beef with it. Many claim it's a made up holiday so that we all go and spend money feeling guilty that we don't appreciate our mothers enough. The sentiment is that we should appreciate our moms not once a year-but all year. I can totally understand that. However, life today is so, so busy. There are many contributing factors to the harried days we live, technology being one of them. Careers are another factor. Many of use move away from home based on jobs and life changes. Our jobs get busier and busier, school years get busier and busier. Many of us don't even make enough time out for our partners, let alone our friends and parents. So if our culture has carved out a day to make our moms feel special and appreciated, forcing us to STOP EVERYTHING and do the same, than I say, HURRAY! But now, about me. After all, it's Mothers Day, and I am a mom of a spitfire, quirky, creative little girl. But what do I want today? What makes a mom feel special in my book? Here are my wishes, and so far we are doing pretty well. Though not sure about #8, but I'm gonna try! #1: Someone else makes the coffee this morning, and preferably Starbucks Spring Blend which is my favorite brew lately. It's light and smooth, matching fresh spring days. 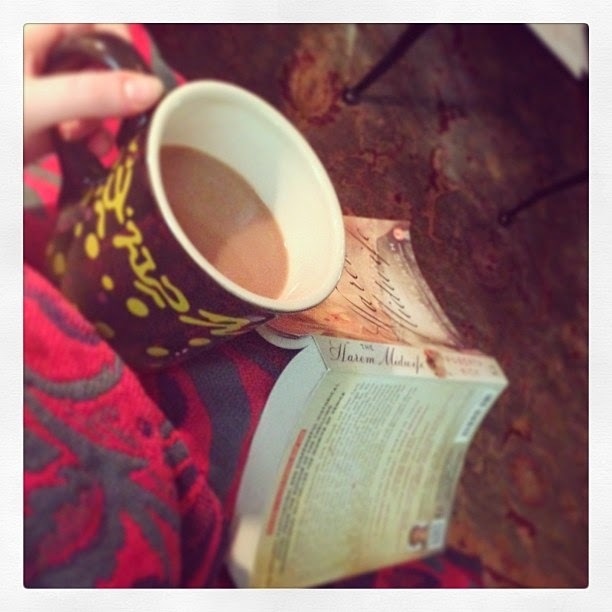 #2: I get to read a book in my PJs with my giant cup of coffee while someone else makes breakfast, preferably crepes. #3: A card from my uber-creative daughter, hopefully with some of her drawn characters in the card, just for me-after which we snuggle. #4: Un-interrupted garden time. Hubby helps dig some holes. #5: A hot bath to wash off the dirt from my garden time, with no one banging on the door asking what I am doing in there. #6: Dinner with my mom and sister (as well as the larger family), honoring them and hanging out with them, preferably with some gut-busting Italian food, lots of wine and followed by another cup of coffee. #7: Blog writing time, which I am doing RIGHT NOW! #8: Paint my nails, and try to fit in a facial. May all your top 10 Mothers Day wishes come true. Have a wonderful day!